About us - Tap water filters, Dafi / Water filters – water filter jugs and vacuum containers DAFI. Openness to modern solutions and progress makes that Dafi brand is constantly growing. Experience, innovation and efficiency are our greatest values. An in-depth knowledge of the market, own production facilities and investment in human potential have helped us to create a brand recognizable in Poland and in the world. Dafi is a brand of products such as water filters and vacuum containers. We have been on the market for over 30 years. In this time we have been able to develop numerous, original and patented manufacturing solutions. We mostly use high quality raw materials from Germany. 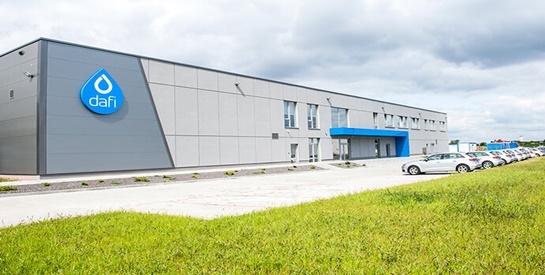 All of the departments responsible for the implementation of our products are concentrated in one factory. This ensures the best quality control, great contact with clients and a quick warranty service. In the interest of maintaining the highest quality of our products we regularly subject them to a wide range of exams and tests. The raw materials used do not contain harmful substances, including Bisphenol A. Our filter bottle has been tested by Hamilton Poland S.A., proving the high standards and safety of use by our customers, including their children. The test results can be viewed here.